During my two days in San Francisco during this trip, I sampled some new fare from restaurants in and around the downtown 'SoMa' area close to my hotel, the Courtyard by Marriott on 2nd Street. 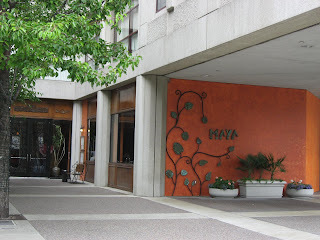 Maya, located at 303 2nd Street is the creation of chef/owner Richard Sandoval who brought this unique Mexican cuisine to the City that has seen it all when it comes to restaurants. Looking to his native Acapulco for inspiration, Sandoval created an authentic upscale Mexican restaurant to showcase a side of contemporary Mexican cuisine that is rarely seen north of the border. I directly went to the entree section and ordered the Torre de Huachinango which consisted of pan roasted red snapper on a warm goat cheese stuffed tomato with spinach salad, avocado rouille in balsamic reduction, and julienne of fried onion. The Pinot Noir paired quite nicely with my entree. 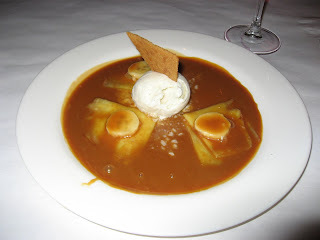 The Cajeta Crepes dessert which my waiter recommended was absolutely delicious: crepes in caramel sauce with slices of banana and ice-cream. Asha is a Thai restaurant on 2nd Street, with soaring ceiling and bustling during lunchtime. I needed a hot soup, and ordered that all-time favorite, Tom Yum. This was a big bowl filled with seafood (mussels, shrimps, crab, scallops, etc.) and a spicy mix of lemongrass, galangal, kaffir lime, tomatoes, and shitake mushroom. The spicy catfish rice plate was interesting too: deep-fried catfish stir-fried with basil, kaffir lime leaves, red bellpepper and red curry paste sauce topped with crispy basil. "Flytrap is classic in style. The yellowed walls are papered with old diagramatic prints separated by faux frames, crisp white cloths adorn the tables, there are fresh flowers everywhere, candles flicker at every setting and unusually-shaped, beautiful white china makes a stunning backdrop for your food. If you are feeling romantic, Fytrap will enhance your mood, especially if you visit between Tuesday and Saturday when live music, courtesy of a grand piano and maybe even a singer, will accompany your meal. Perhaps you will be asked if you would care for a little decoration? As your eyebrows wrinkle up to create a look of puzzlement at the question, handfuls of fresh rose petals are gently scattered on the table in front of you causing you relax into a warm smile. It feels nice here. A basket of tasty hot breads, swathed in a starched white napkin, with a dinky little spheroid of butter, is promptly delivered by the waitstaff who are perfectly turned out, beautifully dressed and some of the friendliest and most accomodating in town." 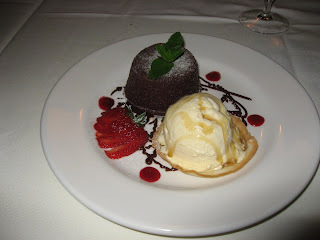 I selected the lunch special of herb encrusted sea bass with shrimp laden mashed potatoes, and followed it up with an Exotic Bomba, a cocktail of fruity sorbet locked inside white chocolate crust. This was a rather quiet weekend at Cupertino. I had a bad cold and had to be frequently on the phone with my family back home. I only ventured out for food and restricted myself to places in the neighbourhood of my hotel. If you stay at the Cypress Hotel in Cupertino, there are quite a few good places for breakfast, lunch and dinner within walking distance of the hotel (that is, if you have tired of the in-hotel restaurant, The Park Place). Le Boulanger (pronounced Luh Boo-lawn-zhay), a bakery/cafe right next to the Cypress, is a great place for breakfast or lunch. They have very good sandwitches made with sourdough bread, bagels, egg and bacon croissants, etc. There is also a Starbucks right across the street to which I made frequent trips for lattes, mochas, and cappucino. Le Boulanger has lot of seating, both indoors and outdoors, and wi-fi; a better choice to read or browse the Internet than the crowded Starbucks. One night I had dinner at the Hong Fu Chinese restaurant located in the same block as the Starbucks across my hotel. I sampled their shredded pork in chilly sauce, kung-pao triple delight with chicken, scallops and shrimps, and fried rice. Pretty good Chinese fare, large portions and good service. On another night, I had a working dinner with a colleague at Armadillo Willy's, a Texas BBQ place right next to the Cypress. I tried their beef brisket which is interesting stuff if you are in the right mood. Make sure you ask for their hot sauce; anything else is for sissies! While I am in the US, my daughter fell ill and had to be hospitalized in Pune; today she was doing better and I feel a little relieved. As I complete my meetings in the USA, I am counting down the days before I can be back with my family again. During the early days when travel took so much longer, how difficult must it have been to leave your loved ones behind, not knowing if they were doing alright for months at a stretch? The most difficult part of travelling on business now is having to answer my four year old angel's questions of why I go away without her so many times. I woke up yesterday feeling a little cold and drained of energy. Not a good sign since I still had an entire week to spend in three cities before I can fly home. I had to eventually borrow some Motrin (the American equivalent of the Indian Disprin) to keep me going through the day. 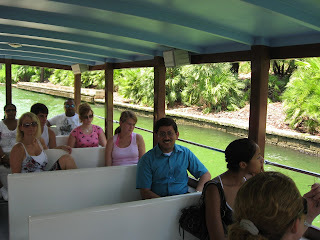 After our 2-day meet came to a close at lunch yesterday, my host took me on a water-taxi ride to the nearby City Walk. This is Universal's version of Downtown Disney. While it is smaller, there is still enough for those who prefer Universal to Disney. 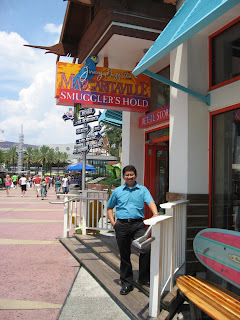 In addition to Universal's theme park and Islands of Adventure with it's roller-coaster rides, the Blue Man Show, celebrity chef Emeril's signature restaurant, a 20 screen AMC cineplex, Hard Rock Cafe and Margaritaville are many of the options available for entertainment, drinks and dining. And of course, there are the ubiquitous shops for gifts, clothes and toys all around. After a nap in the afternoon, I decided the only thing I was in a shape to do was watch a movie. So I ended up watching Ratatouille which was every bit as good as I expected it to be. However, no fancy dinner today. 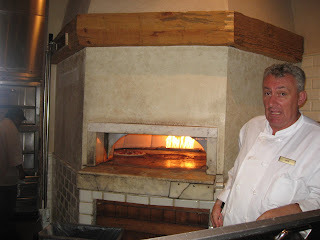 Instead, I got myself an 'Americana' pizza and a tall mocha from Sal's Market Deli within the hotel; it was actually a darn good handmade pizza (check out the picture of it being made in the wood-fired oven!). I had to wake up at 5AM so I could catch a United Airlines flight to San Francisco today. Which gave me time to complete one of the most interesting books I have read lately, Kitchen Confidential by Anthony Bourdain. This book is about an insider's story on the restaurant business with special focus on the heroes of the kitchen. A must read for those who wonder what goes on beyond those steel doors. I bet you will learn a thing or two, such as why you should not order fish in a New York restaurant on Mondays, or what you really get when you order a steak well done! 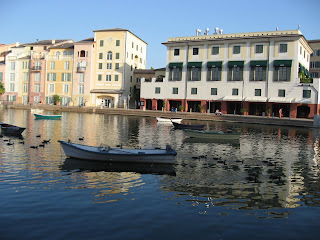 I am spending two days at The Portofino Bay in Orlando. 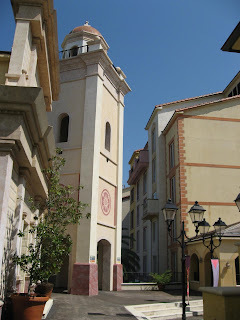 This hotel is in the Universal Orlando resort area and tries to recreate the ambiance of Portofino, a coastal resort located in the Italian Riviera. From corridors that resemble cobblestone alleys, a large waterfront with ducks and boats, to artifacts, paintings, and piped music in the hallways, everything is designed to give you the Italian vacation in Orlando! The rooms are pretty large and the hotel is spread out over a very large area surrounding a man-made bay. Nice touches include scooters scattered around the cobbled streets and the water-taxis that can take you to nearby City Walk, a downtown area with shops, dining and movies. After a full day's work, we went out for a team dinner at Bice. Soaring ceilings with frescos, polished wood, marble floors and graceful flower arrangements give this restaurant a very fancy air, but nothing about the place is stuffy. The waiters are attentive and the dining room is relatively quiet, even when it's full. 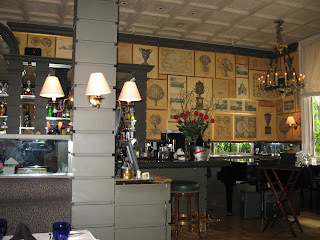 Bice is part of an upscale Italian bistro chain founded in Italy in 1926. It overlooks the Portofino Bay offering a fine waterfront view while dining while live piano music livens up the atmosphere in the evenings. 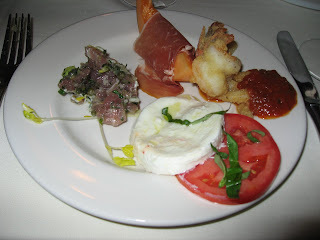 We began with family-style servings of antipasti. The buffalo mozzarella and tomato salad with fresh basil julienne and extra virgin olive was excellent. 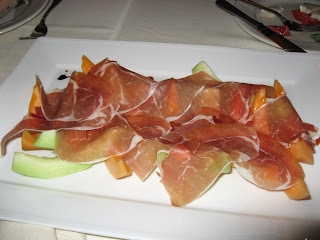 The Prosciutto San Daniele made of San Daniele's ham with cantaloupe and honey-dew melon with balsamic vinegar was very good too. I enjoyed the Tartare of Ahi Tuna with avocado, lemon, and basil cream sauce with crispy shrimp. The crispy fried calamari, shrimps, zucchini and bell peppers with a spicy tomato sauce finished out our round of starters. I went with the recommendation of my waitress for the 'the real Italian experience' in the next two courses. 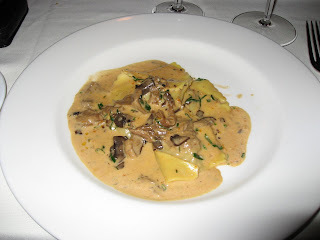 My primo was a half-portion raviolli of braised beef short ribs and spinach in a mushroom and marsala sauce. Excellent stuff, especially with the Amaron dry red wine we had selected! 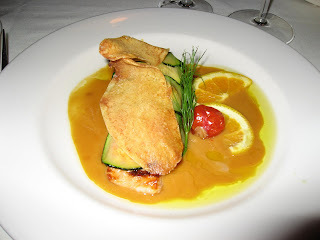 My main course, the secondo, was Oven-baked salmon in orange sauce with potatoes and zucchini. The veal shank with steamed potatoes and saffron risotto which a few others selected looked pretty good too. My dessert choice, the dolce, was an perfect end to tonight's dinner: soft chocolate souffle cake with ice-cream and chestnut honey. Very nice ending to a busy day! We were bidding farewell to my earlier boss who is moving on to fulfill his aspiration of becoming a CEO. We had a team lunch with him at Sullivan's. Sullivan's is a 1940's styled steakhouse; the interiors with dark wood panelling and dim lighting gives a warm ambiance that is great for cosy dining. 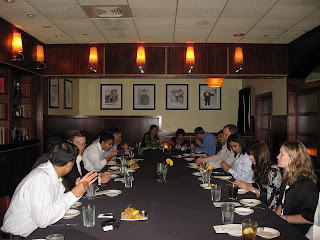 Since we were a large group, we had reserved a private dining area. When I was here the last time, I remember enjoying some of their fine sea-food. A side effect of this heavy lunch was that I don't need to have dinner (I realized that 14 oz = Very Large Steak!). We made a brief detour to a bar in the evening, and one dirty martini later, I was back in the hotel. I have an early morning flight to Orlando and a busy day ahead tomorrow. 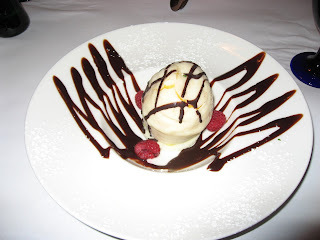 Churrascos is an elegant restaurant in Houston that specializes in South American cuisine. This was my first time at this popular gourmet place on Westheimer. We got in early for dinner, early enough to get a table immediately in spite of not having made reservations. White and red accents with tropical touches gives this Zagat rated restaurant in Houston a dramatic, earthy feel. The service is very good, and the waitstaff knowledgeable and helpful. The signature dish here is the beef tenderloin butterflied (a special cut, churrasco, from which the restaurant gets it name) and served with chimichurri sauce, the Argentine condiment that always accompanies steak. 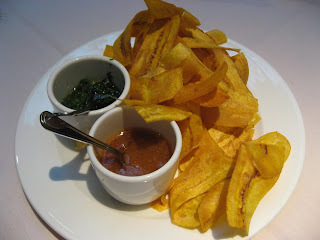 Also very different are the fried plantain chips served at every table, the Argentinean empanaditas, the Cuban-style black bean soup, and the Peruvian-style ceviche. Grilled vegetables come "family style" with every entree. We began with the empanaditas which were crisp with assorted fillings: seafood, ham, etc. 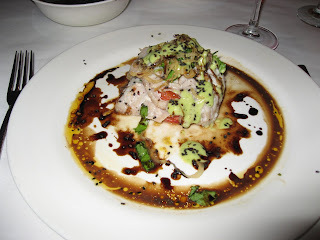 For my entree, I chose the fresh catch of the day, mahi-mahi with crab meat and scallops and drizzled with chimichurri. I shared a side of flambed onions and jalapenos. The entree was great, very filling, and we barely had space for dessert. 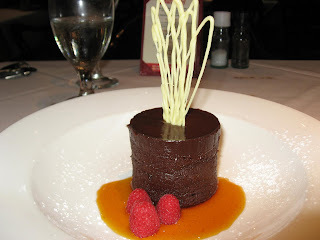 I finally settled on Feugo de Chocolate, a dense chocolate ganache cake with a carmelized orange gabanero sauce. Owner Michael Cordúa from Nicaragua is credited with bringing South American cuisine to Houston. He also owns Americas which is equally popular, noisier, but (I can personally attest) is another good option for fine dining. 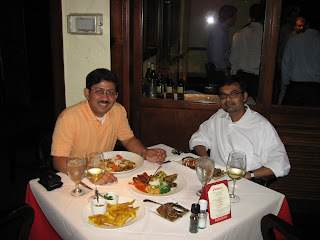 On my way to the USA, I spent the evening at the Grand Maratha hotel in Mumbai. I had time to indulge since my Lufthansa flight was scheduled to depart only at 3AM in the morning. The Grand Maratha is a part of ITC Welcomgroup hotels, also marketed by the Sheraton group in their Luxury Collection. While the hotel is an excellent one with opulent interiors that evoke the royal Indian past, I love it most for it's famous restaurants. 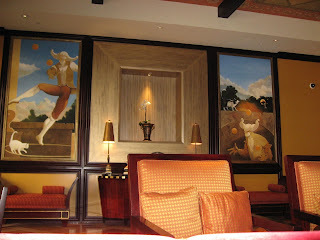 ITC Welcomgroup was among the earliest to brand the gourmet restaurants located in their hotels. Many now know their restaurants, the world famous Bukhara, Peshawri, Dum Pukht, and Dakshin, better than the hotels themselves. I have written about the excellent fare at Bukhara and Dum Pukht in earlier posts; this time I will give you a taste of Dakshin. 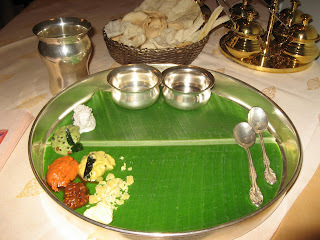 South Indian food is usually associated with the idli, dosa, vada range of snack-food sold all over India, and a popular misconception is that all of South India eats vegetarian food. 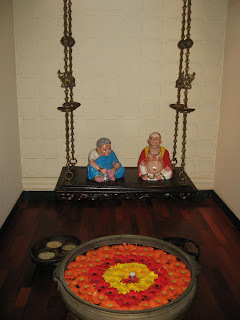 Dakshin, which means South, provides a sampling of of the highly evolved cuisines of the four southern Indian states of Andhra Pradesh, Karnataka, Tamil Nadu and Kerala. Among the large number of choices, you can take your pick of dishes from the Saraswat, Moplah, Mudaliyar and Chettiyar cuisines. Send the taste buds ticking by attacking the kozhi melagu curry (chicken cooked in a pepper gravy) from Tamil Nadu. You could try the kurliche dabdabe (crab meat) of the Saraswats or the thakkali vattichathu (tomatoes in a `kurma'-like gravy) from Moplah kitchen. There is also the meen varuval (pan-fried pomfret) and podalangai kootu (snake gourd and lentil) from Mudaliyar cooking and the famous kola urandai kozhambu (meat dumplings in gravy) and vathal kozhambu (pungent curry of onions, garlic paste and sun-dried gooseberries) from Chettiyar cuisine. Karnataka gives you the masa stew (lamb in gravy) and kadale gassi (black chick peas and potatoes) and Kerala offers meen moilee (fish in coconut milk), kai stew (vegetables in creamy coconut milk) and vendakkai mullakaihathu (ladyfinger in a gravy). Breads include appam, idiappam, puri, kal dosai and there is a variety of rice items to accompany your entree of choice. There are only four desserts: elaneer payasam, badam halwa, paruppu pradhanam and cus cus payasam (poppy seeds payasam with sugar). I began with Meen Varuval, pomfret fillet marinated in a spicy mixture and pan-fried. The many chutneys and pappads made the dining experience interesting. I had also ordered a Elaneer (coconut water) aperitif instead of wine. 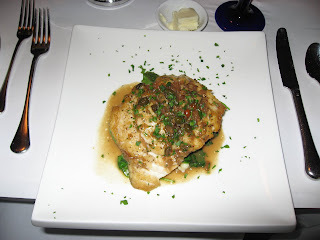 The pomfret was ok, but not great. Next came Kozhi Melagu, tender pieces of chicken cooked in fiery ground peppercorn masala. This was very good; the chicken was very well marinated and succulent. The appam with which I ate the curry was soft yet crisp on one side. Loved it! The gravy was rich with the distinct taste of different spices including the south-indian curry leaves, crisply fried onions, and peppercorns. Finally, the dessert. Elaneer payasam: condensed milk with tender coconut pulp. Very interesting and a great ending! BTW, Lufthansa is one of the few airlines that have their latest business class cabins in the flights to and from India. A rarity, since most other airlines reserve their latest and the best only for their flights to and from the US. Last moment changes in my travel plans! I now have to be in Houston next Monday, before proceeding as planned to Orlando, San Francisco, Cupertino and Santa Monica. 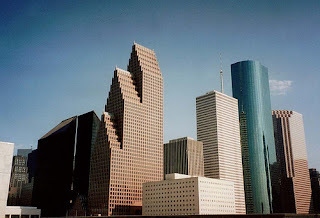 I first visited Houston in the early nineties. 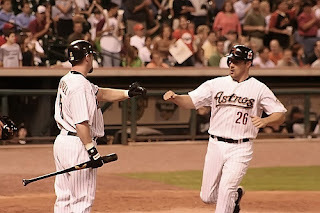 I lived in North Carolina those days, and my first impression of Houston wasn't a good one. Hoardings advertised strip clubs and ugly looking buildings passed by as I drove down the expressway from the airport. There were no green areas, monuments, or scenic views to admire here. However, having visited here multiple times since, I have now delved beyond the surface and discovered a city that can provide some rather unique forms of entertainment. 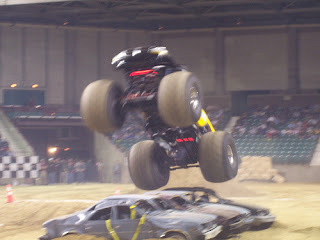 The other fun times were at the Astrodome watching baseball and a Monster Truck Rally. Can't think of anything more American than that! Watching a game live in the US is (almost?) as much fun as watching cricket in India. The same charged-up and noisy excitement (especially if the local team is playing) but with an American twist: hot-dogs, cheer-leaders, mascots, and buttered pop-corn. 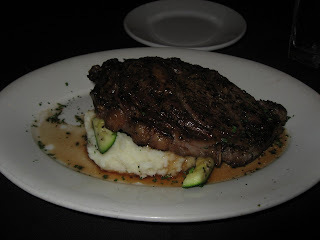 Houston is also a great place for steaks, seafood and Tex-Mex, which is probably another reason I like visiting here. A good place to understand what Americans mean when they say 'Texan sized'! Houston being home to a large community of South Asians also boasts of a number of great Indian restaurants (including completely vegetarian ones). Another Texan city I have visited more than once is Dallas, which I find more aesthetically pleasing than Houston. 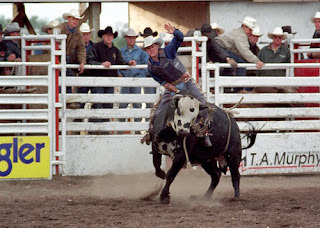 I have earlier posted about my honky-honk experience at Billy Bob's in Dallas; I have also experienced rodeo here (which was smaller than the Houston one), strolled the beautiful botanical gardens, taken a tour where JFK was tragically shot, and spent the evenings with friends listening to live music downtown, where bands play outdoors into the night during weekends. And finally Austin, which I have visited only once but liked very much. Because of the vibrant music scene (Austin claims to be the live music capital of the world), the scenic views, and of course, its bat-colony! Texas has been a melting pot of cultures for a long time. The French and Spanish flags have flown over it in the past, and Texas even became a break-away republic for a while. The World’s Best Restaurant? What must that be like? I was intrigued. I had to find out more. What set off this investigation was a newspaper article which mentioned that Bukhara had been again voted the best Indian restaurant in the world. The prestigious list of the Top 50 restaurants is announced every year by Restaurant magazine. A panel of 651 judges from around the world reviewed restaurants in 70 different countries to compile this year's list. I discovered that the #1 restaurant is El Bulli which has held this position for an unprecedented three times. 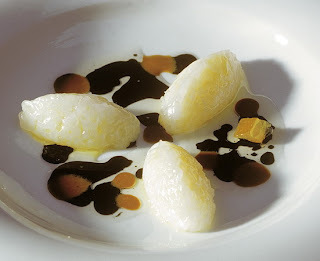 El Bulli was also recently awarded a third Michelin star. Situated in Roses, two hours north of Barcelona, with a dramatic view of the bay, El Bulli is open only from April to September. During the other six months, the chefs are closeted in their nearby laboratory experimenting with new tastes, temperatures and textures that will lead to the unveiling of yet another culinary masterpiece. El Bulli opens for reservations every October for the next season, but usually the entire year gets sold out in a single day! The tasting menu, which changes slightly every day, unfolds in three acts and thirty-five dishes: small snacks that you eat with your fingers, larger-sized tapas to be eaten with a fork and spoon (no knife, ever), and desserts. Each dish is brought to the table by a small squadron of waiters. 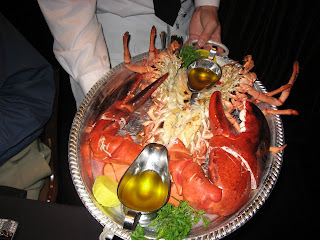 The waiters are extremely knowledgeable and will explain what each item is, and how to eat it: to start with this end or that, to gobble it up in just one bite, or hurry before it melts. “…Then, out of thin air, a wave of snacks (nibbles) appeared, each wildly different in texture, flavor, and aroma. Pork and honey scratchings; an impossibly light, dusty popcorn piece served on a spoon, which disintegrated and then disappeared on the tongue; sheer glass panes of sweet nori seaweed; tiny puffed quinoa grains in a cornet; and a parmesan and lemon crunchy asteroid ball. The next dish was simply entitled bread with tomato. It was a round ball of crunchy bread, a little smaller than a golf ball, sitting on top of a tiny mug of what appeared to be vanilla ice cream. All of the crockery and cutlery is designed specially for each course. Our instructions were to pop the bread in whole and chew, then spoon up the matter in the mug. A big factor in this other-worldly cuisine is the element of surprise, and this dish had it down to a fine art. The bread puff exploded in the mouth to reveal a warm scented olive oil, which when combined with the tomato flavored ice sherbet was an unbelievable combo. Then came the mysteriously titled golden egg, a tiny scarab-sized, sweet button of exoskeleton, which when bitten released the most intense, melting, warm yolk. This was swiftly followed by a mini parmesan ice cream sandwich and a trout egg tempura, in the thinnest coating, but brimming with glossy, wildly juicy fishy flavors. 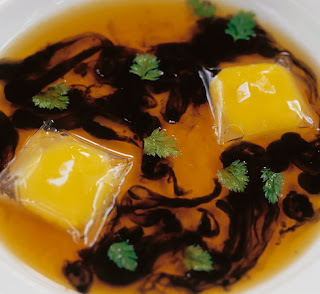 A tartare of cuttlefish was sensual with black ink and brown foie flavors to overload the senses. Risotto a la Milanese was made with chopped bean sprouts, creamy froth and a separate saffron slick. A translucent squid pillow erupted to reveal coconut milk, and you added tangy lime, mint and ginger to the package - a brilliant Thai squid dish. Spider crab, sardines and rabbit followed as main courses. Sometimes, I just shut my eyes and wallowed in the sensory bombardment, only to reopen them and see my companions doing the same. Describes Clotilde Dusoulier of Chocolate & Zucchini (read her entire blog post here), “It took us six hours to go through the entire meal -- from 8pm to 2am -- but we were in such a state of elation that it was hard to tell if it had been two minutes or two days since we had first sat down. I would like to stress here how pleased we were with the service: the ballet of dishes coming and going was perfectly choreographed, and the waitstaff was exceptionally warm and attentive”. 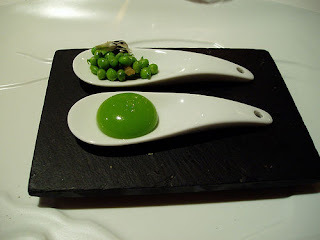 Chef Ferrán Adrià is the genius behind El Bulli's menu. Many consider him the Salvador Dali of contemporary cuisine. He travels the world for gastronomic inspiration, then returns to his Barcelona laboratory to perfect his next masterpiece. His ground-breaking techniques have inspired other chefs throughout the world to experiment. "Taste is not the only sense that can be stimulated: Touch can also be played with (contrasts of temperatures and textures), as well as smell, sight (colors, shapes, trompe d'oeil, etc. 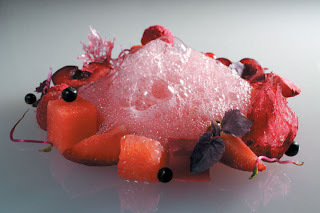 ), whereby the five senses become one of the main points of reference in the creative cooking process," says the El Bulli website. Pricing: The tasting menu is 165€ and that doesn’t include wine. With wine and coffee you're looking at roughly 220€ per person. Reservations: E-mail: bulli-at-elbulli-dot-com or Fax: (34) 972 150 717. No phone calls. The restaurant is open from May until September, and starts taking reservations in mid-October for the next season. Send an email round October 15th with the number of people in your party; you will get a response in the next few weeks. BTW, the road from Barcelona to the restaurant is pretty treacherous and can be an adventure in itself! 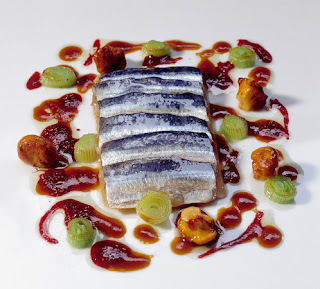 El Bulli's move to #1 in the Top 50 list relegated The Fat Duck in England, to #2 for the second time. The two restaurants have similar approaches to food -- both are known for dishes that combine unusual ingredients using sophisticated scientific techniques. 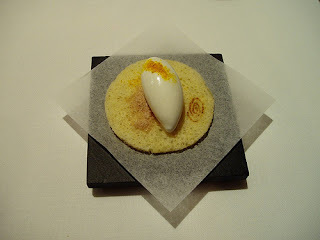 More on The Fat Duck in another post! Remy, the new super chef is in town! And the critics are giving him a thumbs-up. I am talking about Ratatouille, Pixar's new animation movie which releases this weekend in the USA. 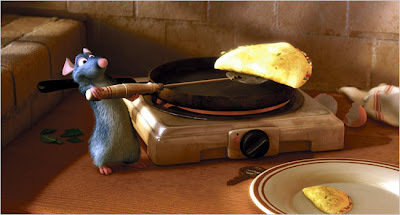 The hero is a young rat, Remy, who lives in the French countryside and has a passion for fine cooking. While the rest of his family is happily content eating garbage and leftovers, he is drawn toward a more lofty notion of food by his refined palate and by the example of a famous chef who insists that “anyone can cook". With unforgettable characters and surprises at every turn, this is the story of how Remy goes on to become a gourmet cook in a Parisian restaurant, no less. Fellow foodies please note. Chef Thomas Keller, of Per Se in New York and French Laundry in the Bay Area, served as a consultant for the kitchen scenes in this move, and the result is one of the great food movies of all time. "Displaying the usual meticulousness associated with the Pixar brand, “Ratatouille” is a nearly flawless piece of popular art, as well as one of the most persuasive portraits of an artist ever committed to film. It provides the kind of deep, transporting pleasure, at once simple and sophisticated, that movies at their best have always promised. ", says the New York Times. See what the other critics are saying about this movie at Rotten Tomatoes. This is animation director Brad Bird's new creation for Pixar after the delightful Incredibles. 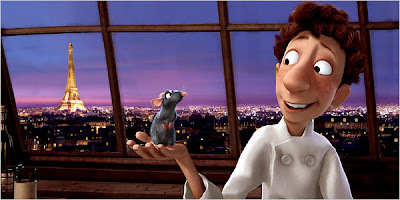 And for those who are wondering, ratatouille is a traditional French stewed vegetable dish.